Dozens of female leaders in the business and non-profit sectors took the elevator ride up 15 floors on Tuesday to the Rideau Club in order to attend the first of a new series of networking events geared toward women. 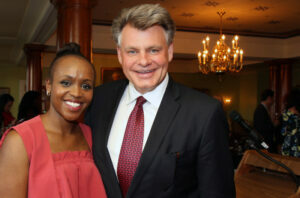 Solange Tuyishime with Peter Nicholson at the inaugural Entre Nous networking event for women, held at the Rideau Club on Tuesday, May 22, 2018. The inaugural Entre Nous get-together just so happened to take place in the portrait presence of Sir John A. Macdonald — Canada’s first feminist prime minister, some might say. The initiative, supported by the Rideau Club, Foundation (WCPD), and the non-profit organization Elevate International, is part of a broader effort to bring more women into leadership roles. In Canada, only 14 percent of board seats are occupied by women, and that’s just not good enough, said Elevate International founder and CEO Solange Tuyishime. “If we want more girls to be leaders, they need more role models,” she said in her opening remarks inside the private club, to which she belongs (as do the likes of Algonquin College president Cheryl Jensen, RBC regional president Tina Sarellas and Startup Canada CEO Victoria Lennox). Incidentally, the Rideau Club saw more new members join last year than any other year in the club’s 152-year history, and that’s partly due to the leadership of its new (and first female) general manager, Carol-Ann Goering. 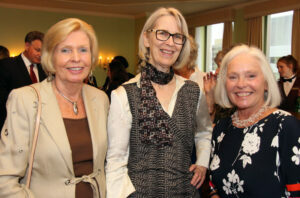 From left, Shirley Westeinde with Rebecca Aird, a director with the Ottawa Community Foundation, and Barbara McInnes. In the room were such familiar faces as construction industry trailblazer Shirley Westeinde, retired non-profit chief executive Barbara McInnes and community builder Sarah Onyango. 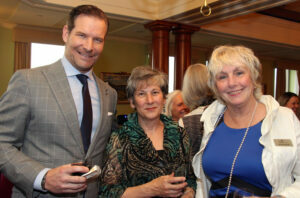 Attendees also included the Rideau Club’s membership liaison, Ted Wagstaff, and Peter Nicholson, president of Foundation (WCPD), a public donor-advised fund. As well, OBJ publisher Michael Curran dropped by. The featured guest speakers were Carley Schelck, partner and CEO of The Urban Element, and Kathy McKinlay, the president and CEO of Ottawa Network for Education (ONFE), which collaborates with community partners and works side-by-side with educators to bring innovative and essential programs into schools. Schelck shared her career journey, which saw her get recruited fresh out of university by Canadian Pacific Hotels to work at its Algonquin seaside resort in St. Andrews, N.B. followed by its iconic Royal York, before she got involved in a new cooking school in Toronto. The experience opened her eyes to her potential as an entrepreneur, and to the idea that she could be applying her workhorse ethic to something that she owned. 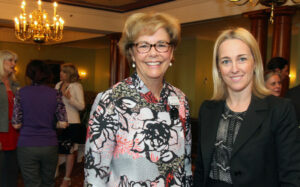 From left, Kathy McKinlay and Carley Schelck were guest speakers. “What I quickly realized was that I was working hard for somebody else’s business when I could have been doing it for myself,” said Schelck. She convinced her husband, Oliver, to move to Ottawa, where they opened their cooking school and culinary venue in an historic fire station on Parkdale Avenue. They’ve been in business for almost 13 years and, as proof of Carley’s success, she was honoured this spring as a finalist for a WBN Businesswoman of the Year Award. McKinlay’s talk included five tips for good leadership. They were: Be authentic, focus on one’s team, create a good work culture and embrace challenges, and to have those difficult conversations, rather than shy away from them. “I remember early in this journey when one of the staff that I was working with presented me with a parking ticket as one of her expenses. I remember thinking, ‘Oh, this is so hard, I have to tell her that I’m not going to pay for her parking ticket’. You have to get over that. Now I wouldn’t think twice about having that discussion,” she said. When it came time for McKinlay to recall her fifth and final tip, she referred to her cheat sheets in order to remember. It was look after yourself. “That’s the one I always forget,” she said, as the room full of women erupted in knowing laughter. Organizers plan to turn the new networking series into a quarterly event, featuring one or two speakers each time. – Photos & video by Caroline Phillips, Ottawa Business Journal. Wealth Creation Preservation & Donation Inc. The Foundation (WCPD) is proud to be an Imagine Canada Caring Company. As such, we invest a minimum of 1% of pre-tax profit to strengthen Canadian communities and contribute to a vibrant, healthy society.